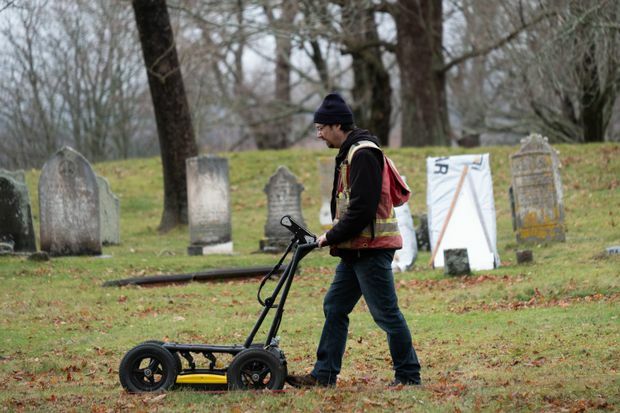 A researcher uses ground-penetrating radar to scan beneath the surface and collect 3D data at the Garrison Graveyard, at Fort Anne, in Annapolis Royal, N.S., in a December 2018, handout photo. Archaeologist Sara Beanlands says there is compelling evidence to suggest the unmarked site in western Nova Scotia is the final resting place for Acadian settlers buried near a fort as early as the 1680s. “With respect to Acadian history, this was – and (nearby) Port Royal is – the cradle of Acadian civilization,” says Beanlands, senior archaeologist at Halifax-based Boreas Heritage Consulting. She says the underground anomalies picked by the ground-penetrating radar – a device that looks like an electric lawn mower – could be an extension of a nearby British cemetery. Beanlands’ research included the use of aerial drones and Lidar – short for Light Detection and Ranging – to produce an extremely accurate picture of the site’s contours. Though the glowing anomalies don’t show much, their arrangement is unmistakable. At a depth of one metre, the irregular shapes appear at regular intervals – and they are aligned along a north-south axis that is in line with the British graves.